It's your life. It's your body. It's our mission. If you are trying to lose weight and gain muscle (without deprivation or starvation), reach out today for your zero-pressure, free consultation. Our team is made up of myself, Tiffany Stafford, and my cohort Branden Scalera. I'm a National Academy of Sports Medicine CPT (Certified Personal Trainer), FNS (Fitness Nutrition Specialist), and BMS (Behavioral Modification Specialist), along with being a Life Coach and single mom to an amazing little boy. I’ve spent the last 13 years counseling, coaching, and training people from all walks of life. Branden is a NASM Certified Personal Trainer as well, and specializes in healthy, sustainable weight loss and strength training. We absolutely love what we do! Hearing the positive feedback from hundreds of clients and getting the huge hugs on weigh-in day are the moments that drive us to be the absolute best at what we do, and we'd love to help you become our next success story. My gorgeous private studio, located conveniently in the Tanasbourne area of Hillsboro, OR is the ideal place to focus in on what you're trying to achieve. You'll shed fat, build calorie-burning muscle, learn about proper nutrition and have tons of FUN because there are no distractions, no one staring at you, no waiting for machines or wasting time walking all over a huge gym. Lots of studios say they offer private training, but have 8 to 10 trainers and their clients in a small, crowded area. My studio is truly private and your sessions are 100% confidential. 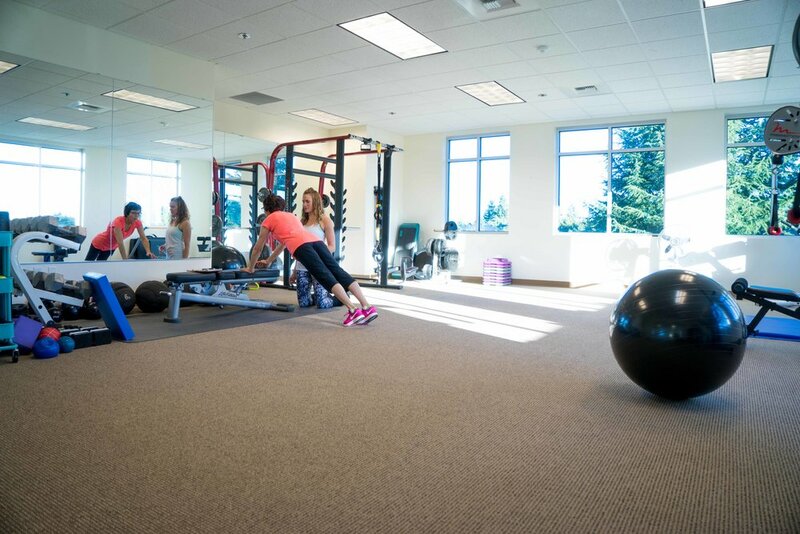 It's clean, bright, and uncluttered, with lots of space for functional training, dynamic exercises and flexibility. There's very little overlap between Branden and my sessions, so regardless of which of us you end up working with, you'll feel safe, comfortable, and catered to in our lovely space. You're also invited to come early or stay late from your session and get your cardio in downstairs while looking out the big windows or reading your favorite book. The sitting area and free Wi-Fi are ideal for getting some work done or jumping on a phone meeting, and your kids are welcome to cozy up on the couch and watch their favorite show. I've worked hard to create a space you'll want to spend time in, and I hope you'll soon feel at home here. Come check it out for yourself! If you're ready to learn more, click the button below and schedule your free consultation with either Branden or myself. We'll answer any questions you have, help you dial in to your exact goal and why you want to achieve it, and give you all the info about schedules, price options, and what training with us will be like. This is a zero pressure chat on our comfy couch, or even from the comfort of your home if you'd prefer a phone or FaceTime meeting. Click below and let us know how we can help you today!